Yá'át'ééh!!! (hello). I am from a small community in Northeastern Arizona called Ganado. I am a Native American, Navajo (Diné) to be exact, and I have been raised all my life on the Navajo Nation. I am the youngest of two children and a proud uncle of two awesome little kids. I am in my third year at Dartmouth with plans to pursue a career in medicine--particularly clinical practice and community outreach and prevention. My hope is to be influential in the formation of effective tribal health care policies. My family is instrumental to my success and credit them for so much--they are for me, my life line. I am in my third year as an undergraduate at Dartmouth. While my aspirations are strongly directed toward Native America I have a collective desire to help communities most in need. These communities are rooted in a rich heritage and are committed to fostering a better livelihood. 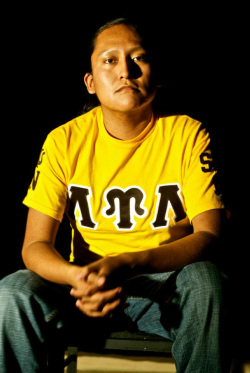 Lambda Upsilon Lambda has many values that are in line with my own, including education, service, cultural appreciation, and family. But one of the greatest draws was the desire to be a part of something greater than myself. As an individual I can do some good things but I know that being a part of a larger collective of individuals--who share similar insights and goals--can do things so much greater. For these reasons, and so many more, I decided to pursue a life in la Fraternidad.